skarphedin says that either side of the US Flag is the Arizona State Flag and the other side is the University of Arizona flag. Thanks to mistersh0w and Lottery Ticket for first telling us about the clue. I'll repost here: only connection in Lostpedia to Arizona is Hurley's dream of drive there with his dad. I'm going back to bed now, but I have seen that the Dan Brown book "The Lost Symbol" will be launched on September 15th according to the University Book Store web page. Given the possible link with the Da Vinci Code in Masquerade that may well be when it is going to happen. Interesting... At my uni you need a uni ID for bookstore access so it'll be interesting to see if that's the case if the bookstore is where the next event will take place. ...& Nice connection there, Zort. Scoutpost is going to be so happy! She's in Phoenix! maven- I know!! I'm soooo excited! As long as it doesn't happen this weekend- since we'll be at the Grand Canyon. But the 15th would seem a likely tie in and although Tuesdays are not a good day for me...I could probably rearrange things to get down to Tucson. Wonder if my mom would want to go with me...let's see how do I begin to explain? This conversation could go much like Hurley explaining the island to his mom. I hope you can make it, scout! Yeah that'd be awesome. Hopefully you have a better experience than we had this week here in NY. I'll bet it's Saturday, Scout. They'll probably give out another hard clue sometime tomorrow during the day...and the final easy clue Friday nite at midnight. Been trying to draw my own connections about where the events are being held...and how it might connect to the show...(Nice connection BTW, LotteryTicket! )...but so far...nada. Was wondering if it had something to do with where the artists are located...but too lazy to google all that. Which character do you hope the newest frame will feature? I'm wanting to see a Ben...or Alpert! Or maybe a collage of the Others...with Mr. Friendly, Goodwin, Ethan, Miss Klugh, Patchy...surrounding Ben and Richard...with a signal fire plume of smoke rising in the distance...that spells out "The Others" as it rises. I'll be bummed if it ends up being over the weekend...rotten luck. Ben MUST be featured in one of the posters! An Other collage would be great, Cheif Brody! Scoutpost: How long of a drive would it be for you? maven- door to door it would probably be a little less than 2hrs. It takes about 1 1/2 to get to Tucson. Let's just hope they wait until Monday or later to reveal it. seems like all of them have been on Tuesdays, haven't they? i think that zort put us on the right direction; the page of "The Lost Symbol" on the Arizona Bookstore website has a really convincing countdown! That reminds me I must update the timeline post for the latest poster. Is it me or does the front cover of the Lost Symbol book remind anyone else of the Startgate symbol for Earth ? OH MY GOD!!! I literally used to live 30 feet from this bookstore and i can get to it by bus in 15 minutes, so i will definitely be there with my phone taking any pictures and sending updates!!! I can't believe they are doing something in Tucson!?!?! I'm assuming it's quiet today because of the 9/11 anniversary. Thoughts and Prayers to those that were affected, directly or indirectly. 8 years ago the world changed. Never forget! Great for you CerberusVenting! You'll be our eyes and ears. If you twitter, let us know. I'm late as usual ! but here. maybe watch this site for a clue ? zort, are you saying Lost is going to do some cross-promo thing with the Lost Symbol? That would be odd, imo. Dan Brown's books are such a huge franchise unto itself; seems like this would just muddy the waters so to speak. Plus, Disney wouldn't couple with Sony (owns film rights to Dan Brown stuff) -- or would they? Anon - Yes it would be odd to do something cross promotional, but you never know. Has anyone spotted that underneath the Frame 5 picture frame there are some extra pixels. It could just be that the person creating the image was a bit sloppy as they do line up, sort of, with the handshake pic or it could be another part of the larger mystery. I think I have to say sloppy, as they do line up with the portrait original if you resize them to both match. Just played Mr. Brown's lost symbols game. Took a while to get it perfect. You get a message about find a encoded phone number on 33 books that he is signing (or something like that). After a few more posters MY room might start to look like that. Thanks for the link, Lottry Ticket. Starting to think this weeks poster may involved college life! Run up to 22nd registration for LU. Hey I've got a site suggestions for the banner of images. It would be a nice touch if clicking the posters along the top bar would take you to the corresponding post with all the information about that poster. A few times I've unconsciously clicked one expecting that to happen and figure it could be a quick way to get to an older post. i don't know how all this works so i guess just follow CerberusVenting however you do that. It was something I had been thinking of anyway, so you gave me a prod I needed to get it done. Is the new header what you were thinking of ? Thanks CerberusVenting, I'll go and follow you now. Clue 2 up for frame 5. So I just called the U of A bookstore and asked if they knew anything about any events there in the coming week, or anything related to L O S T, and i could literally hear the girls face on the other end doing a WTF? she put her manager on who also hasn't heard anything yet. Seems they are as clueless as the employees at the other locations. Yes! Exactly what I was thinking of! ...Though it occurs to me now that a link to the category for each frame would work too (and include all subsequent clue posts). Also I emailed the admins (and I'm assuming you get those emails?) a QTVR I made of the book store. It's low res... I may try and post it somewhere and link to it in the comments if I can figure out how. Not really helpful as far as clue solving, I know. Congested - yes the admins got the QTVR, I'm not sure what to do with it though. There is a home Arizona football game tomorrow night. I'm thinking the timing may be about right. Congested, you are making me work hard tonight, I've gone back and categorised every post relating to frame 1, 2, 3 and 4 and updated the header so when you click on it you see all posts for that frame. Here's a link to photo from BearDown FB page. Shows those cute mascots. Who's going to a football game? But wait, it can't be in the stadium. Is there a public tailgate? Or, sports pub/club. There's a polar bear looking at me. ^^That page has music with the Bear Down Arizona song. The wikipedia page already linked on the 2nd clue post has the lyrics. A quick YouTube search also has some clips of the song being sung at games by fans. Good work everyone, I'm going to bed now, back tomorrow. Dharma wheel? at the zoo. Just looking around. Fun stuff. A tie in with this would be awesome. It starts on the 14th. Boy, a polar bear poster would go fast I bet. 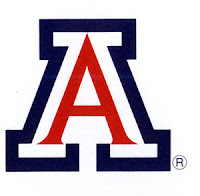 I believe it's UofA against NAU at the football game tomorrow. Seems like a reasonable place to reveal a new poster. Think they'll post the new site on the scoreboard? Seems like they would need to be more precise that the reveal would be at a game to make sure some Lost fans show up. And, if it's inside the stadium, that would mean Lost fans would be paying for a ticket. I'll have to catch up on the action soon - I miss you guys! Hi, ML! How dare your boss do that! LOL Hope it's still not in effect during Season 6! It may be worth it for someone to try contacting the Athletics Dept. or someone involved with the team to see if they know anything. With no clue yet I'm doubting anything will happen tomorrow... having said that they posted late Monday as well... If I were near Arizona I'd be buying tickets to tomorrow's game and plan on keeping my eyes glued to any jumbotrons that may be at the stadium. So.. I plan on being there one way or another at 7:30 am,Tuesday the 15th,unless clues indicate otherwise. Inorder to accomplish that,,I would be leaving from Phoenix,,,very early..5 ish....Now..if any body would like to ride along,,say ,,even split gas cost,,keep me awake during the ride down..I need to know soon. I have room for one person, comfortably ,,two , but someone is going to be cramped..In any case, there are other options as well,,rent a Van?? Anon: Sure sounds like the bookstore is it. I think the Bear Down clue was to let us know it was UofA...which was already known...you guys are always a step ahead of the clues! Check with Scoutpost...she's in Phoenix. She's so looking forward to something happening in AZ! hopefully a couple more clues, I don't want to be glued to the computer this weekend, lol. you guys should use twitter, lol. I think we're all stressing a bit over nothing. Looking back over the other poster posts/clues leading up to the release of the website, all of them have told us at least 24 hours in advance where to be and when to be there so i think we just need to wait for the next clue and then we'll know for sure. I'm guessing that the clue won't be at a football game. If I'm not mistaken, ABC owns ESPN. Even though there is a game at Arizona today, it's not being broadcast on ESPN.
" Bear Down" is also a song,,a pep song,,so ,,it is sung at every Uof A football game...but we already got that. Stressing?...no, no,,,just creating a future,,turning a dream, into a reality. Mel, just don't do too much performing in the book store. I've updated the timeline post and moved it to the post before this one for anyone that wants to see it. Anon- I would love to go with you since I'm in the Phoenix area too, but I have kids I'll have to get to school and even make arrangements for my third who has speech therapy that morning. I was going to try hard to go, but I won't be able to leave until 8:30 and since others are going to get there at 7:30 (which is great!) I probably won't even try to go at this point. Hope you make it without problems- maybe we'll know more when they post the next clue. It's a shame you won't be able to go to UofA and find the url for the next poster. I know how much you wanted to have something in your area. Hope you have fun with your Mom at the Grand Cannon this weekend. Scoutpost - Have a great time at the GC, I've always wanted to go there some day. I'm not going to be around tonight as Mrs Zort is doing a charity walk at midnight, and I'm a marshal on the route. I'm assuming the reveal won't be tonight as there hasn't been an announcement yet. I received an overnight Saturday delivery package from Alexandra again! They are very specific with the timing of the release of other parts as well. 2nd time! CONGRATS! Thank you so much for your most recent purchase of our fourth released print in the LOST Underground Fan Art Project, "Eric Tan For The Crash." What amazing speed your fingers must type at in order to be the first person to order two prints in a row! To thank you for being the first order, much like we did with the giclee print last time, we have included the custom made Cupcake Dharma jumpsuit worn by Crumbs bakery on the day of the poster's release. Wear it in good health. Or even wear it on your first day of school. That's when all the cool undergrads wear their new digs. Thank you for your purchases and keep up the fast fingers! I have a feeling we may see some Lost University T shirts at the book store. The jumpsuit is brand new with all of the tags. Nothing special about the tags or anything. Wow TomRex, that is fantastic. I hope we will get a picture of you in the jumpsuit. I'm a big guy - over 6'4" and the jumpsuit was not made for my type. WOW...TomRex...you're starting quite the collection! Take of pic of it! Do you think the "hint" in your letter is "first day of school". Did UofA start already? Nope, UofA started in August. BTW: If the jumpsuit doesn't fit your body type....I'm sure it will fit mine! They must be keeping track of who is ordering if they recognised that you are a 2nd time first purchaser. TomRex you are the man! Can't wait to see photos! "new digs" not "new duds" ? Is the Student Union new? Monday/Tuesday looks right. Still curious as to why AOZ. I was still hoping for the polar bear at the Dharma-wheeled-gardens-zoo. Right Zort70? I just found virtual tours at the Bookstore. Cool. I'm I the last to discover this? I'm usually pretty good at finding the exact screen cap for DCaaBP clues. However this one's eluding me. I have screen cap of image from AoZ trademark specifcation page. The mark is number 32. But I can't find where it's being used. Anyone see the blue background image? I'm a little behind on reading comments, but was this always part of the BearDown clue? "Wildcat Readers, see you on - J. Perkins/R. Morrison"
amy lynn you beat me. Let's figure this out. But it's also the mascot, right? It could just refer to "readers" as people who read books? Hmm just saw it too. Could they be players? Richard Morrison is on the roster it seems. I think it's the player's saying "See you on ___" with the date left blank. Arizona is playing Iowa next Saturday. That's still a week away... pretty far for how fast these clues are coming. 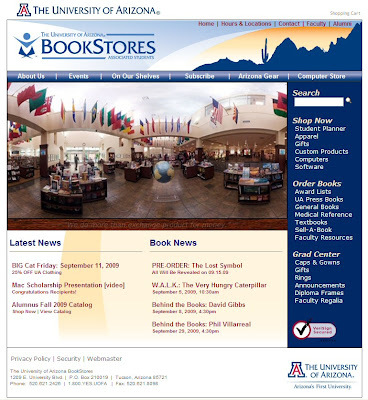 The Arizona Bookstore on 9/14. Looking through the Daily Wildcat...nothing yet. gkpipes: That's pretty good! Tuesday it is! Wildcat Readers ? in the library? Where did the bookstore info come from? ...Ah I see. The date was made using their player numbers (9/14). There is a reading area in the Bookstore/Student Union. I'll also take a look at the library. Sent Zort70 google earth image where you can see roof top of gym and library next door. need time. Think you'll get a book? What's the poster? What the webaddress? New Clue "Wildcat Readers, see you on - J. Perkins/R. Morrison"
Perkins is a safety and Morrison is a QB. Watch the football game tonight I bet. Hi all, I've just got back in. I'm going to look through all the new stuff now. Regarding the URL's please don't post them in comments here. If people want to be spoiled then they can go find the info themselves, but they won't find it here. Please note everyone that the link mentioned contains what I consider to be spoilers, do not go there if you don't want to know. I would love to know how this was discovered. Both the blog and the sites. Without going into details on the spoilers I'll just say that TPTB can easily make adjustments if they are so inclined. Djinn - apologies but I have removed your postsas they contained the links to the spoilers. Please email the admins email if you have any concerns.